Dub Pistols Barry Ashworth will fly out Thursday to take part in the greatest show on snow Snowbombing. This years is the festivals 20th anniversary so Barry as been invited out as one of the events royalty having been a regular since the event started. 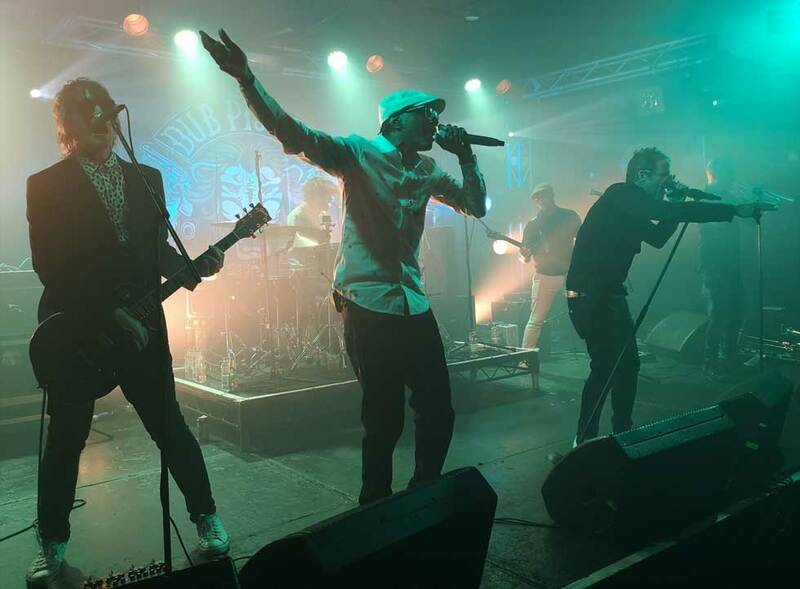 Oh no, here we go again… it’s the annual Dub Pistols at the Wedgewood Rooms Review. Only this time around, the mighty Pistoleros had something extra special up their sleeves. Thanks to Beats and Swings along with the Wedgewood Rooms, the legendary Ragga Twins were coming to Portsmouth. Last year’s Wedgewood Rooms show was a superb yet crazy diamonds Saturday night, the previous being an epic 2-hour affair. Then there was the Dub Pistols appearance at Victorious, very much one of the Sunday highlights, ending a mucky weekend. The Pistols having had the festival crowd dancing in the mud and rain, while there was a threat of it having been cancelled altogether. 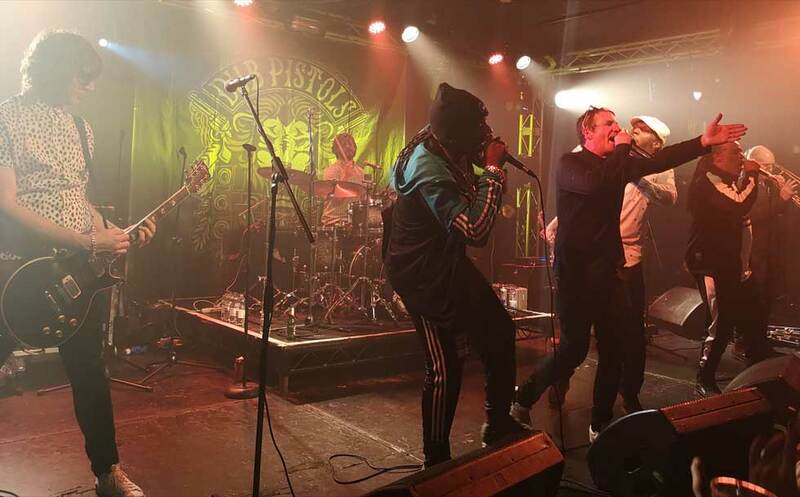 As for the annual return to the Wedge, Dub Pistols were ready to get the Portsmouth crowd jumping once again. Fronted by Barry Ashworth and MC Seanie Tee, the pair feed off each other brilliantly, while clearly lapping up the admiration from the crowd. 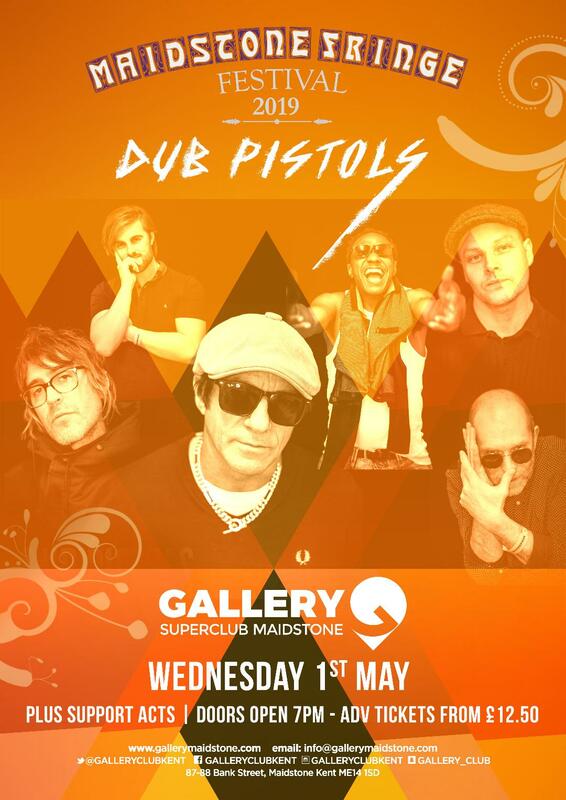 I’ve said it before, but Barry Ashworth and the Dub Pistols clearly love coming to Portsmouth, and so they should. With the performance in full swing, a couple of big numbers were put out early on in the set, before it was time to mix things up a bit. Introducing MC’s Deman Rocker and Flinty Badman to the stage, better known together as the Ragga Twins. Having already featured on the Pistols “Mad on the Road” this was, of course, a fantastic live track, but the energy, in general, was off the scale. Both Barry Ashworth and Seanie Tee remained on the mic, as all 4 vocalists bounced off one another as if this was a regular occurrence. However this wasn’t your average gig, in fact, that’s what makes Dub Pistols such a great act, there’s always something new to appreciate. The moment Beats and Swings announce the Wedgewood Rooms show, you know it’s going to be one of the gigs of the year. Just when booking tickets, there’s still uncertainty of what you’re going to get. Sometimes there’s been Rodney P instead of Seanie Tee, other times both and then tonight it was all about the Ragga Twins. 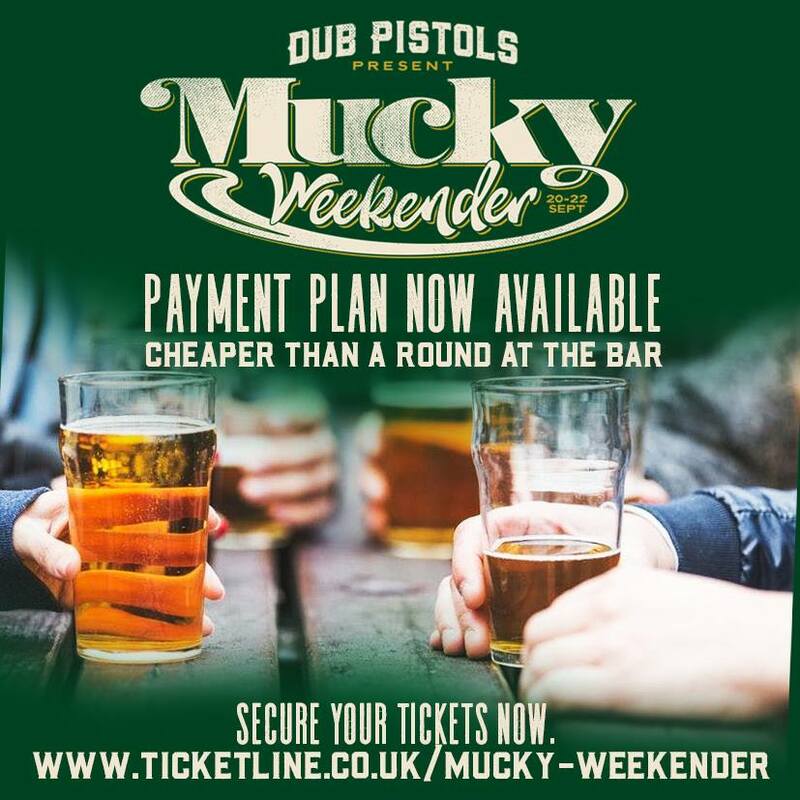 The Dub Pistols are already a contradiction of styles, with influences of rock n roll mixed with drum n bass, breakbeats and plenty of dirty bass lines. However, throw in a couple of London’s finest jungle MC’s and you’ve got one hell of a party. As to how the Dub Pistols are going to top the Wedgewood Rooms show next year, well that’s anyone’s guess. A music festival without mud. Where people open gates for you, say “excuse me” and move aside to let you to the bar. Where the tantalising aromas of great food mix with the nostalgic smell of steam from the resident railway, conjuring up memories of a bygone industrial age. Where both young and old come to share new music experiences, together. Where the sound of live music is everywhere whilst you wander through a fascinating museum dedicated to life in Rural England. And where fans laugh, smile and nod to each other with a familiarity gained only from their mutual annual pilgrimage. 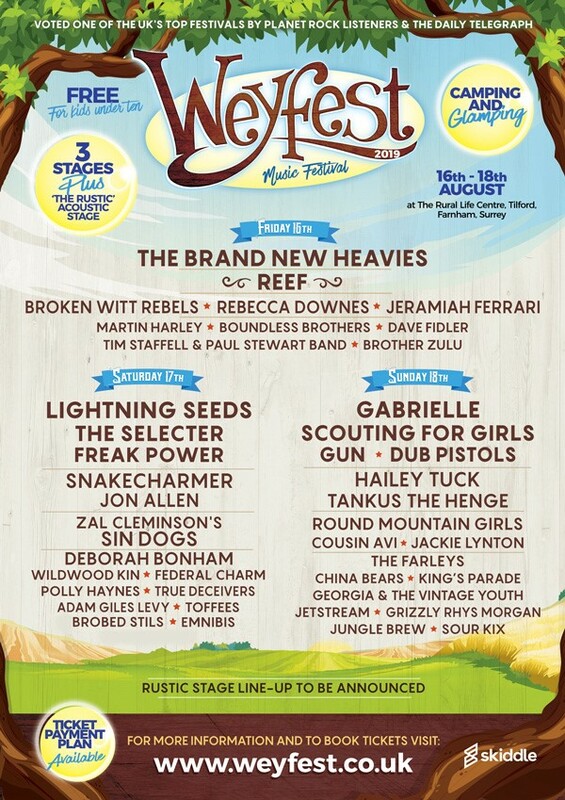 Weyfest is more like a mini-holiday than a music festival. It is a stress-free weekend in the country, with over 30 hours of the finest music, camping, posh loos, friendly staff and plenty to occupy the kids with music, drama and creative arts workshops, train rides and the many attractions offered by the open-air museum which is the venue itself – The Rural Life Centre, Tilford, set in the outstanding natural beauty of the Surrey Hills. You can stretch out your picnic rugs or wander around the site to the 4 stages with your camping chairs. Sit and watch your favourite band or discover new artists from the eclectic mix on offer, or just find a quiet spot to watch the world go by. The festival attracts new people every year – many of whom have not been to a festival for years for fear of mud and rude or drunken behaviour (there’s none of that here!) and many who have never even been to a music festival before! Most have made new friends and now return each year for a reunion. The venue itself is also a major reason for Weyfest’s increasing popularity. The Rural Life Centre is a working museum, littered with artefacts of past country life and craft displays throughout the venue. Is there another festival in the world with a working light railway, running both steam and diesel trains around the perimeter of the venue? And because the venue is so compact, everything is within easy reach. No trudging for miles from the car park or campsite, no long walks between stages … and no major journey to reach the excellent food and bars! Once bitten you will truly be smitten! We look forward to greeting you this year – and every year. 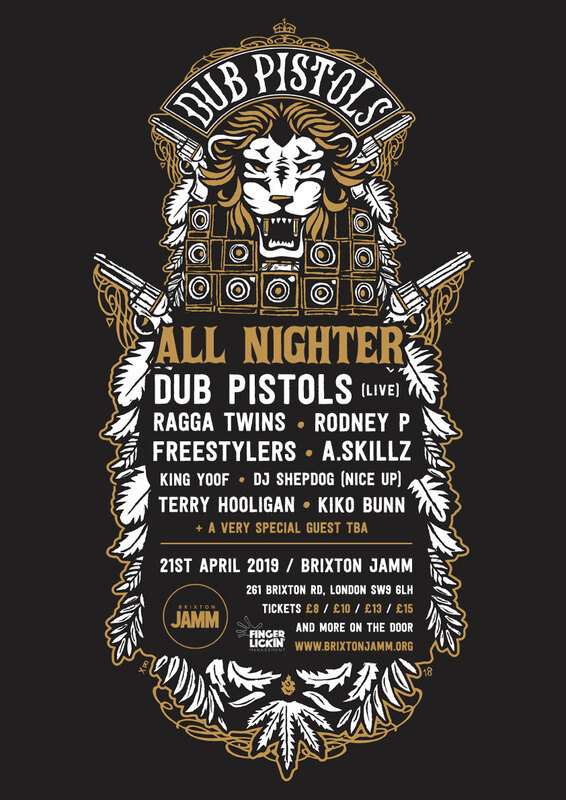 On Sunday 21st of April we’re bringing our All Nighter to the heart of Brixton. Spend your Bank Holiday right and immerse yourself in a rampant mix of Dub, Reggae, Ska, Punk, Breaks, Beats and Drum’n’Bass. A host of friends and special guests join our carefully curated, Bass-driven line up. Catch legendary Junglists The Ragga Twins, original Hip Hop MC Rodney P, Bass pioneers The Freestylers, Funky Breaks sovereign A.Skillz and many more at our annual take-over. We’ll also take the stage for a full band live set, that’s guaranteed to be a full-on, dub-quaking extravaganza. 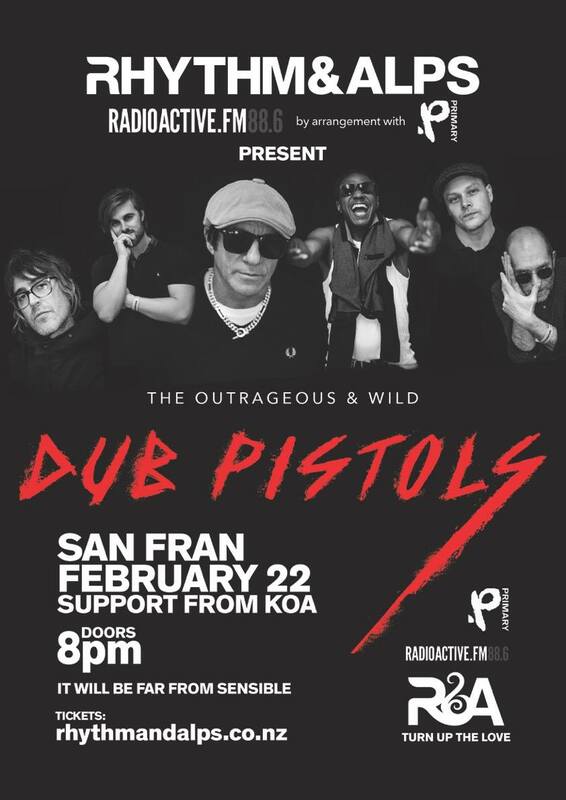 Dub Pistols start the years live shows this week in New Zealand. The band will play 2 shows first up is Wellington at the San Fran Bath house on February 22nd then fly to Auckland the following dat to play the incredible Splore Festival on February 23rd.